How are conflicts between voltage sources or signals resolved? I am trying to understand what happens when 2 supplies or voltage signals are tied to together as I come across similar situations where a Totem-pole output is also being pulled-up by a weak pull-up. In these cases I am wondering if the signal would conflict and result in an unknown final voltage level. Also, wouldn't the voltage difference between the signals cause unwanted current to flow between them which could be undesirable? 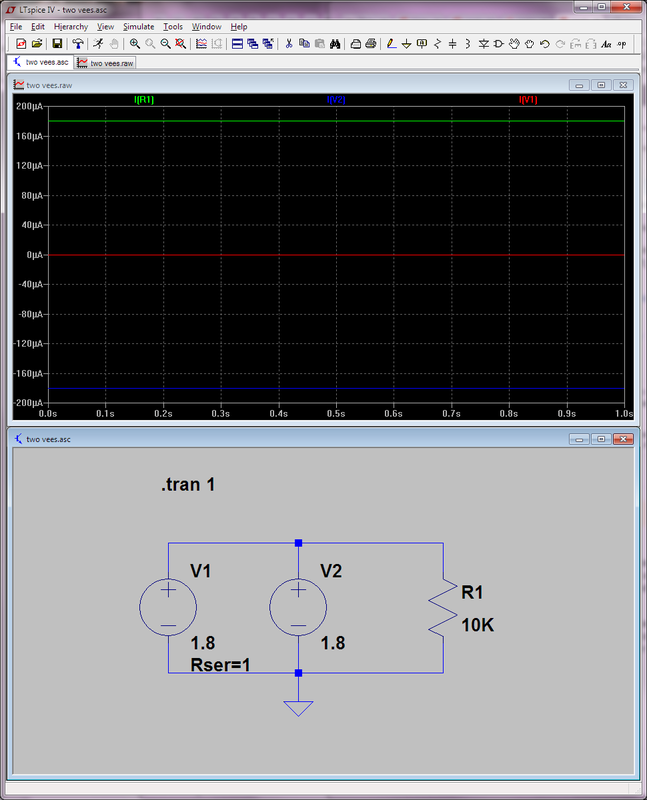 I did a simple simulation in LTSpice where I have 2 DC voltage sources connect in parallel across a load. On the right side are the current measurement results. The simulation result showed that the voltage across the load is 1.8v. On checking the current in the simulator, I observe that DC supply V1 provides the 0.18mA to the load, but DC supply V2 doesn't. I am wondering - how does the simulator decide which voltage sources provides the 0.18mA to the load (in this case V1 is providing 0.18mA and V2 is 0mA)? Also, shouldn't the current be provided equally by both supplies (V1 providing 0.09mA and V2 providing 0.09mA)? Thanks for any help in developing a better understanding. In real life you have no such thing because all sources have internal resistance. Also, judging by the fonts, it looks like you're using the Mac version of LTspice. With the PC version (4.23h), I can't reproduce your result; even with the same voltage on both sources I get the above message/dialog. ... then it's totally obvious that both ends of R2 are exactly at the same potential, so you get 0 current through it, and so 0 current though the source that has a Rser, as long as the other source doesn't have one. A voltage divider has 1 input and 1 output. The classic schematic of a potential divider we have the input voltage at the top, a resistor connecting it to the output voltage, and a further resistor connecting to ground. But the thing is that ground is also a voltage. And there is no requirement for the second voltage to be ground. So instead of subtracting 0V, dividing, and then adding 0V as we do with a ground-referenced potential divider, we subtract the second voltage, divide, and then add the second voltage, with a ground-referenced divider simply being the degenerate case of subtracting and then adding 0V. Not the answer you're looking for? Browse other questions tagged analog circuit-analysis ltspice or ask your own question. How do I simulate a dc-dc boost converter in LTspice? Assumed wrong direction for current through voltage source on branch?